There are two more distinction sittings in 2017. These are fully booked. Please note a change of date for the September sitting which will now take place on 23rd September at Visual – GB Shaw Theatre, Carlow. Bookings for 2018 sittings will open soon (www.irishphoto.ie). Applications for March and May 2018 sittings on Monday September 4th at noon. The March session caters for L and A levels only while the May session caters for all levels. The provisional dates for these sittings are March 3rd in Portlaoise and May 19th in Mullingar. The Application fee must be paid at time of booking (or via cheque immediately) and is non-refundable and non-transferrable to another sitting, so book wisely! 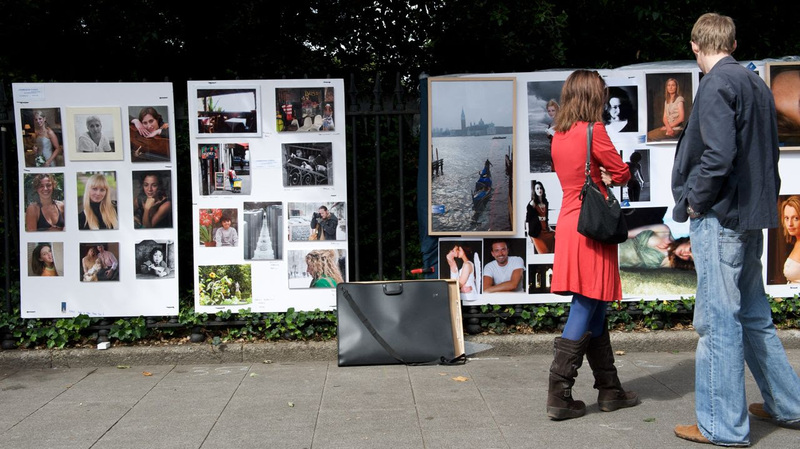 Every year in August The Peoples Photography Exhibition is held on the railings of St. Stephens Green and for the last number of years the IPF has exhibited at it and this year is no exception. It’s a great time to see what the IPF does for photography in Ireland and meet and discuss photography with members of the Council.The People’s Photography Exhibition is a unique opportunity to enjoy a showcase of striking images in a relaxed atmosphere in the heart of Dublin city. This Summer’s event features a diverse selection of work from enthusiasts, clubs and international award-winning professionals. Themes on display include landscape, monochrome, photojournalism, portraiture, creative, nature, analogue, digital and abstract. This exhibition is the ideal option to do something different at the weekend and what’s even better, it benefits good causes. The exhibition, held each August for the last 30 years, is a significant national affair and has become the largest outdoor photographic exhibition in Ireland in terms of both the number of photographers involved and the number of works on view. The event is run on a non-profit making basis. After expenses are paid, donations are made to charity. Past donations have been made to the Dublin Simon Community and the National Council for the Blind of Ireland. Combined totals of more than €8,000 has been donated to each organisation from the proceeds of the exhibition over the last number of years. If you are looking to learn from one of the masters of lighting, you’re in luck this August as Michael O’Sullivan is hosting two workshops is Cork! Book your place now to avoid disappointment as availability is strictly limited. Check out Michael’s website (mosullivanphoto.com) for more details and to view other upcoming workshops and events.